Tesia Bryski, M.Ed., RP (q), is a Registered Psychotherapist (supervised practice) and an active practitioner, student, and teacher of mindfulness and meditation. In 2018, she completed her Masters of Education in Counselling Psychology at the University of Ottawa, with a specialization in Mindfulness-Based Interventions in psychotherapy. Tesia is also a Registered Yoga Teacher (RYT-200) and teaches at various yoga studios across the city of Ottawa. She can be reached here or via the contact form on this website. Siobhan Nearey, M.Ed. (Counselling), CCC, RP (Registered Psychotherapist) initially started studying mindfulness as an academic pursuit. Once she started actually training in mindfulness techniques, she found the process significantly more rewarding (and more of a challenge). She has found mindfulness training to be very valuable in both her personal life and in her work with clients. Siobhan is interested in the role that mindfulness can play in burnout prevention and recovery. She is also interested in finding ways that technology can help us to stay more mindful instead of more distracted. Siobhan has pursued training a variety of mindfulness modalities such as MiCBT and MSC. She is in private practice and can be reached at Viewpoint Psychotherapy. Marie-Andrée Papineau, M.A., RP is a Registered Psychotherapist trained in Mindfulness-based Symptom Management and has attended trainings in Mindfulness-integrated Cognitive Therapy, Mindful Self-Compassion, and the .b Mindfulness in Schools program. 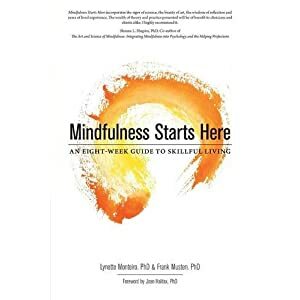 Marie-Andrée discovered the practice of mindfulness as a path to further well being in 2006. Equipped with an experiential knowledge of its profound benefits, she went on to complete her M.A. in Counselling and Spirituality. As a long-time professional in healthcare management with the federal government, Marie-Andrée brings a unique perspective to workplace stress and the benefits of mindfulness. With the intent of furthering her ability to utilize mindfulness in a professional context, as well as deepen her personal practice, she has expanded her bilingual teaching by offering workshops to various organizations in the Ottawa Region. She is awed by the infinite discoveries and possibilities that arise through mindful practice and she appreciates the increasing awareness it permits. Marie-Andrée can be contacted here. Corien Peeters, Ph.D., C.Psych. is a registered psychologist with the College of Psychologists of Ontario. Corien has co-led MBSM courses (MBSM M4 Core, burnout resiliency, Mindful Self-Compassion) at the OMC since 2009. She has attended training in MBSM, MBCT, MiCBT, and MSC. She maintains a small private practice at Sea Glass Psychological Services where she provides therapy to those struggling with anxiety, depression, OCD, depression, trauma, interpersonal relationships, and burn-out. In her work with individuals, Corien uses a collaborative, integrative approach drawing on cognitive-behaviour, experiential, interpersonal and mindfulness-based (MSC, MBCT, DBT) approaches. Since 2008, Corien has also been providing psychological services to youth and families struggling with eating and associated depressive and anxiety disorders at the Children’s Hospital of Eastern Ontario. She can be contacted here.